Eat your veggies! In North America, the tendency is to get our vegetables from sources other than the best available. The best example is the humble spud. Of course, potatoes can be fried, baked or mashed and served with gravy (or gravy and cheese curd for poutine)! They’re considered comfort foods and French fries have really taken over both as one of the most prevalent types of fast foods available and as a side dish offered in any restaurant. Not that we shouldn’t give the potato its due. 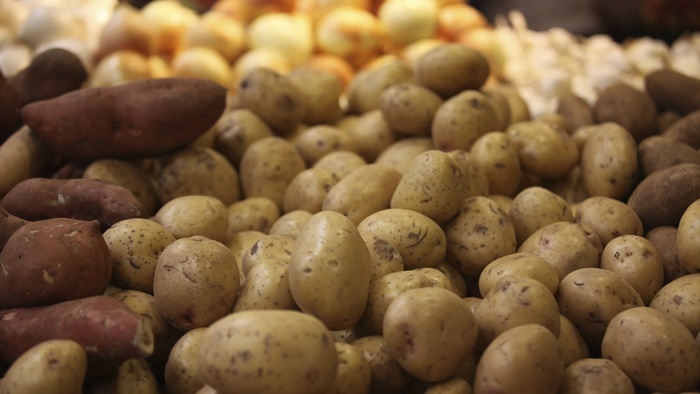 Potatoes are a good source of fiber and nutrients, but they mainly contain high glycemic carbohydrates. Not the best thing for us. White potatoes are high on the glycemic index with a high GI score of 85. With such a GI score, white potatoes have a tendency to increase blood sugar rapidly. If you are trying to control your weight, it’s not a good idea to consume potatoes on a regular basis. Although they contain water, fiber and nutrients, potatoes are the underdogs of the vegetable world, mostly serving as a source of high glycemic starchy carbohydrates. Vegetables, on the other hand, are relatively lower in calories, full of fiber and extremely high in vitamins like vitamin C and folic acid. All vegetables are considered to be low on the glycemic scale. The darker and more colored, the higher the concentration of active nutrients. They also contain much more pigmented compounds called carotenoids, including beta-carotene, zeaxanthin and lycopene, that can reduce cancer growth, control free radical production, help prevent the formation of cataracts and reduce inflammation inside your arteries. These types of vegetables are also the precursor for the production of vitamin A, which is so necessary for proper immune function and night vision. Dark leafy vegetables like spinach and kale provide most of the human requirement for vitamin K, which is an essential nutrient responsible for blood clotting and proper bone formation. Other vegetables like the cruciferous family containing Swiss chard, cauliflower, broccoli, cabbage, collards and bok choy also contain chemicals called isothiocyanates that have powerful effects on liver function, cellular detoxification, inflammation and cancer growth signalling. The intake of these types of vegetables is directly linked to a reduction in cancer risk. Vegetables are king also because the increased intake has been consistently linked to the reduction in the risk of developing heart disease, stroke, diabetes, obesity and dementia. They keep blood sugar, cholesterol and blood pressure low, and provide a great source of volume to the diet. Cooked, grilled or stir-fried vegetables keep you feeling full and satisfied. And you can eat them guilt-free and not worry about gaining any weight. For cooking, roasting and barbecuing this summer, vegetables are wonderfully versatile and can add color, taste and texture to your meals. I would have to say that I would give the nod to vegetables versus potatoes when it comes to your health. Vegetables come out the easy winner. “Glycemic Index,” Self: Nutrition Data website; http://nutritiondata.self.com/topics/glycemic-index, last accessed July 2, 2014. Nierenberg, C., “Leafy Greens — Ranked and Rated,” WebMD website, March 1, 2011; http://www.webmd.com/diet/healthy-kitchen-11/leafy-greens-rated, last accessed July 2, 2014.